The building was constructed as a homestead forming part of Mount Laura Station. 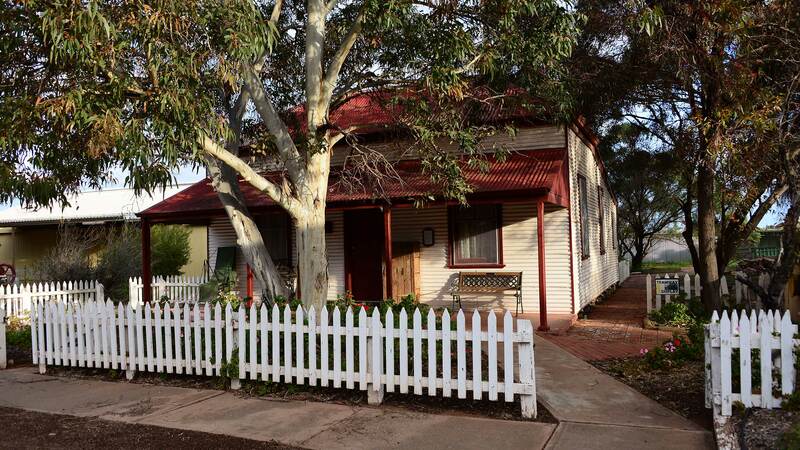 The museum is operated by the Whyalla branch of the National Trust and is in the centre of the city. The museum grounds include the Gay Street cottage - built by the BHP Company in 1914 for rental to its employees. The building was constructed as a homestead forming part of Mount Laura Station and continued as a sheep station for some 30 years until the homestead was handed back to the Lands Department. Attractions include a steam locomotive which in 1902 hauled iron ore from Iron Knob to Hummock Hill, the Nicolson and Lions Engine Sheds which house more than 60 stationary engines, the first police "lock up," a blacksmith's display, a telecommunications museum featuring items from the Overland Telegraph era of 1872 to modern day satellite communications, and a collection of horse drawn vehicles and agricultural implements in “Barber’s Barn”. Enjoy the beauty and serenity of the heritage rose garden featuring the Women’s Memorial Sculpture. There is disabled access to the toilets and all areas of the Museum. Location: Ekblom Street, off Nicolson Avenue, behind Westland Shopping Centre & adjacent the Whyalla Public Library. Open: Weekdays 10am to 3pm, Sunday 1pm to 4pm. Closed Saturday. Cost: Adult $5.00; Pensioner $4.00; Child $2.00; Family (2 adults & 2 children) $10.00. Group concessions.